The pattern is Jalie 2213, a now out of print anorak pattern that I got in paper format from Sew Squirrel a little while ago. 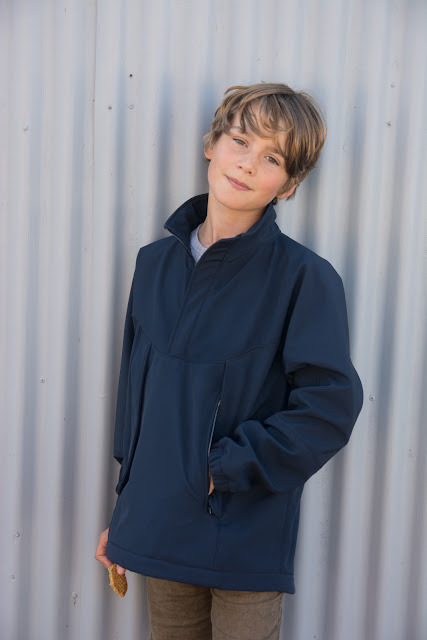 It's a two-layer, bonded fabric: Navy showerproof nylon outer and a red, microfleece inner. 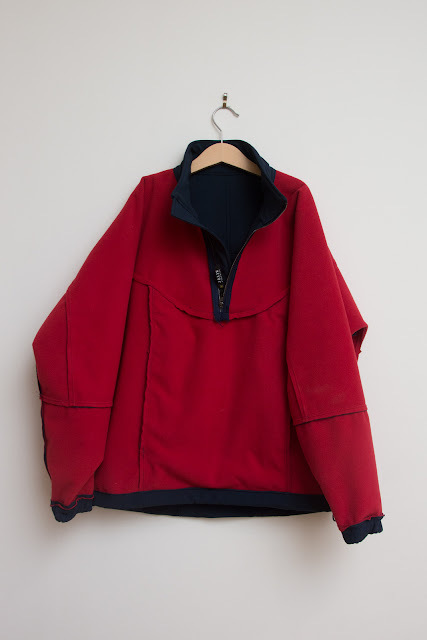 If you have a good memory you're probably shouting at the screen and reminding me that I already have a huge cut of windproof two sided navy/red fleece in my stash (used here) and you're right. But this is a bit showerproof as well as being a whole lot lighter and easier to sew. Totally justifiable. The pattern is an absolute delight. I find the drafting of Jalie patterns to be spot on. The pattern pieces are always very well marked and match up perfectly. I've made size N as per his measurements with no alterations whatsoever. That bears repeating. No alterations. 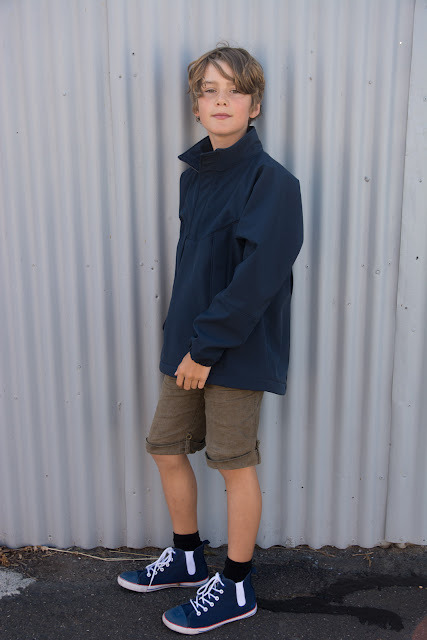 This is the kid that I usually add anywhere from 5 to 15cm to sleeves in order to have them reach his wrists. 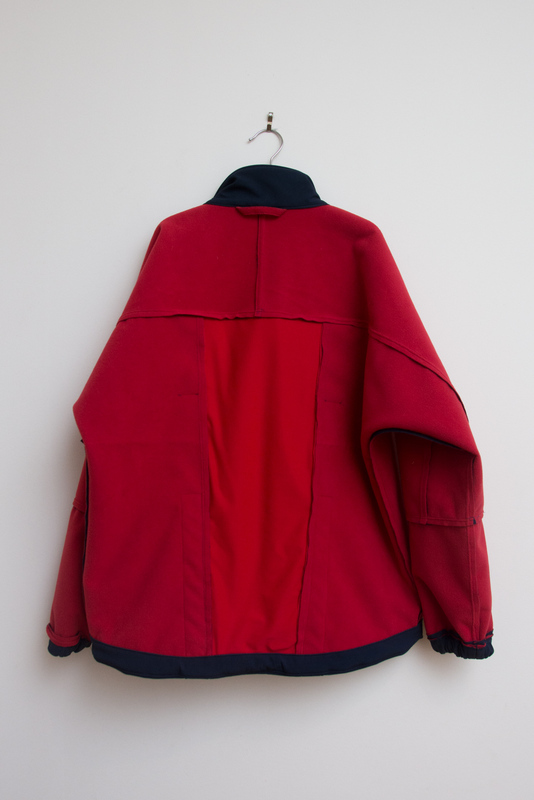 The sleeve is largely part of the the top panel and is generous in both width and length. 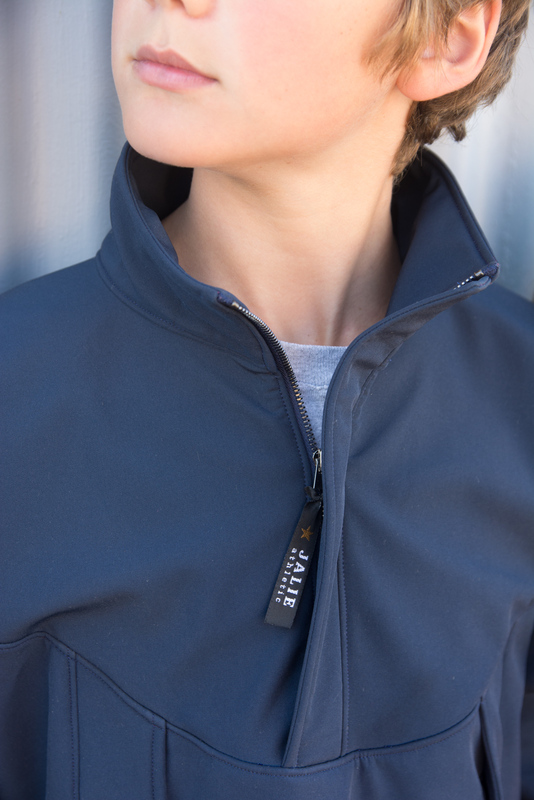 The combination of generous sleeve length and that shirt tail back hem make it ideal for winter cycling. The bottom hem can be tightened with an elastic drawcord and toggle to keep the wind from getting in from underneath! 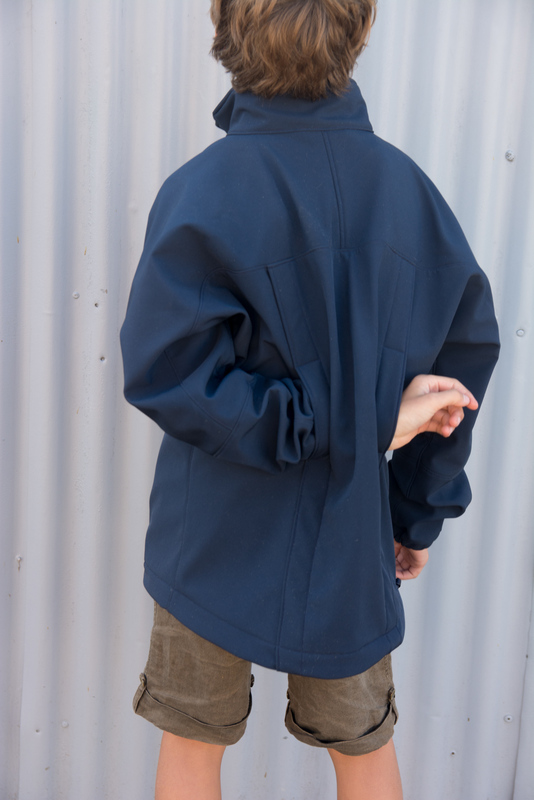 The front pocket is one big kangaroo type pocket with zippers under those storm flaps. I struggled to find zippers I liked and eventually had Jimmy at Jimmy's Buttons shorten some navy zippers for me. It turns out that the pattern requires you to trim the front yoke zipper anyway, so the lesson is to find long enough zippers and then cut them to fit yourself as you sew. Jimmy had cut the zipper teeth to the length I specified and that meant the pocket zippers were slightly longer (the tape above and below wasn't included in my measurement) than required. Luckily I could make my welts a bit longer and still have them hidden under the flaps. He also dyed some elastic cord and the plastic toggle navy for me - such a gem. That photo reminds me: The one alteration I did make was to add a hanging loop. There are a lot of panels and lots of topstitching to do. But, since none of my seams needed finishing, I could just trim them, topstitch them down and move on. And so it all came together fairly quickly. I wasn't expecting a great reaction. 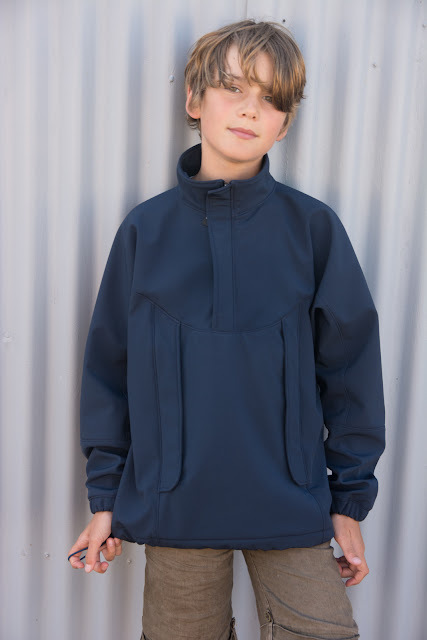 He had turned his nose up at the pattern, saying he much preferred a full front zip. He had also asked for thumb holes and cuffs that would cover the backs of his hands. I always like to sew a pattern as it is the first time through and so I stubbornly ploughed on, thinking there could always be another version another day. And then I was enjoying myself so much with the making that I stopped caring. Then I tried it on and loved it. Yes, it just fits me. A bit tight through the body, a bit too short and the sleeves only just come to my wrists, but absolutely wearable in a pinch. I instantly wanted to make one for me, one for A, another one for P... I'm keeping my eye on the other colourways of this fabric in Spotlight and the minute they go on sale, I'll be all over them. Once he tried it on, he loved it too and the happy ending was there for both of us to enjoy. Notions: 3 zippers, thread, and a cute little zipper label that I got from Jalie when I ordered patterns directly one time. Wow, what a result! And good score with that fabric, too. That was a super helpful pattern review. If Jalie suddenly get a flood of pdf requests for this pattern you should get a kickback! THanks. I think I'll need one for camping or cold winter sports mornings. Nice work! I'll be looking for that fabric for myself now. I love the Jalie patterns too. he he, one of my late night internet wanderings is often into the outdoor specialty fabric sections of websites. If only this kind of stuff was more readily available here. This is KILLER. Can you make one for me please? So cool! 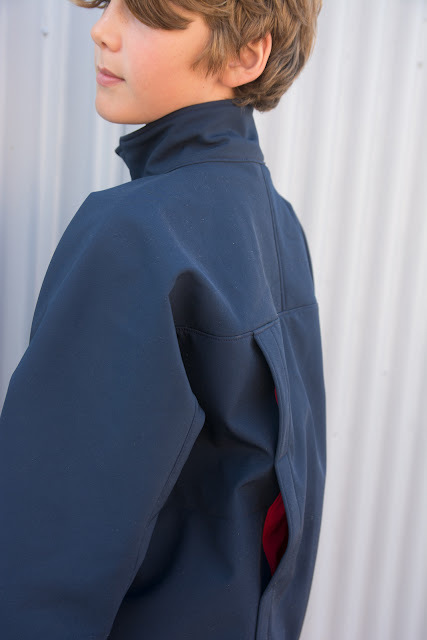 And of course you need multiple cuts of navy wind/waterproof fabric with red microfleece backing. Obvs. I'd say I'll post this one to Joe when it's outgrown, but I don't think he's that much younger, is he? We should all have one!! Can I have one too please? 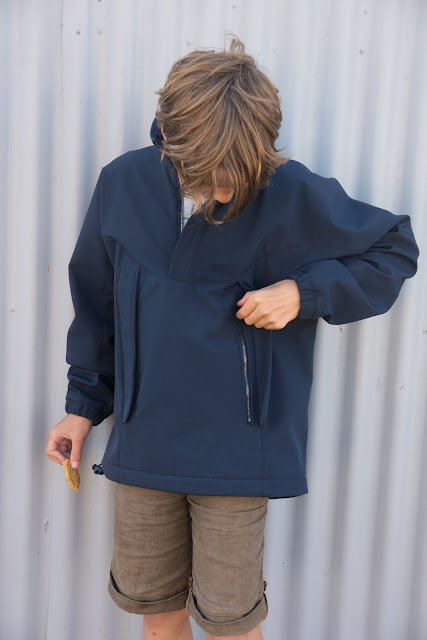 Great looking Anorak and maybe I need to check out Spotlight. Has P been in more than a shower wearing it? No real rain yet, but it will come I'm sure. Spotlight have really lifted their game in the last five years or so. I would almost consider it a place worth looking for all sorts of different fabrics nowadays. It's only ever been a thread merchant in my eyes previously.